﻿ How to Choose a Domain Name for Your Blog » Red Mango Marketing! You’ve decided to start a blog. You’re ready for the world to learn more about your business, your passions, or both. One of the biggest challenges to getting started is finding the right name for your blog. Figuring out a good name is hard enough on its own, but it gets trickier when you have to think about finding an available domain name. At this point in the game, most domain names you can think of off the top of your head are either taken or owned by someone who wants a lot of money for them. It’s important to have a domain name that closely matches your blog’s name, or your readers will have a hard time finding you again — especially when you’re just starting out and won’t have much presence on the search engines. 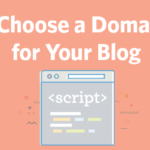 In short, you need a domain name that’s both available and relevant to what you’ll be writing about…bonus points if it’s catchy or has some personality! 1. Brainstorm keywords related to what you’ll be covering. Make a list of all the words you can think of that have anything to do with your blog. Be broad here, really get as many words down as you can think of. Now add other words or concepts that feel on brand to the list. These can be animals you like or adjectives or descriptive nouns that you feel describe your brand well (think Smitten Kitchen or Nerd Fitness). Spend some time browsing popular blogs out there, both those in your space and not, to get some ideas. Once you have a big list, go to thesaurus.com and run each of the words on your list through their search to look for synonyms. Every synonym you like the sound of should go on the list as well. Starting out, you want a lot of words to work with. 2. Check the sound and availability of several combinations of those keywords. Now start trying out combinations of the words on your list. How do different combinations sound together? Which combinations just feel right to you? As you come across combinations you like, check on their availability as a domain name. By running them through HostGator’s domain search, you can quickly see whether you can get the name as a .com (preferred), or another domain extension that could work for your purposes. 3. Narrow down your list of options based on availability and which ones you like. Rule out any combinations that don’t sound good or aren’t available. Give priority to names available as a .com. There’s nothing wrong with going with a .net or .us domain extension, but your visitors will have a slightly harder time finding you since people tend to automatically type in .com when trying to visit a website. In this step, try to get your list down to your top five -10 name possibilities. You know the domain names for your top choices are available, but you still need to check if the name is associated with another business or web property before you commit. You don’t want to find out after you’ve bought the domain and launched that you share your name with something unsavory. Take a minute to Google all your top picks and see what turns up. Even if there aren’t any less than respectable websites out there with a similar name, if you end up choosing a name that sounds a lot like that of another popular blog, it could be confusing for people. In addition to Googling your top choices, check what’s out there on the main social media sites. Ideally, you want to be able to grab the same name on Twitter, Facebook, and Instagram that you use for your blog. 5. Judge your options on memorability. You’re really close to being able to make a decision at this point, but consider one last thing before making your choice: Will people be able to remember the name you’re considering? Enlist your friends to help you figure this one out. If your name is forgettable, people who like you may never make it back for a second visit. 6. Register your new domain name. Now you’ve considered all the main factors you should. Time to make your decision. Which one of your top choices feels the most like the name you want to present to the world? Register the domain for the name you choose and start working on your blog. It’s time for the world to hear what you have to say. You’ve chosen a domain name…now what? Once you’ve chosen and registered your domain name, the real fun begins! You can now start publishing blog posts to help your audience and give your business a strong online presence. Want to hit the ground running when you hit publish? Here are seven blog post ideas that will engage your readers every time. The post How to Choose a Domain Name for Your Blog appeared first on Constant Contact Blogs. This entry was posted on Monday, July 31st, 2017 at 9:45 am	and is filed under Blogging, Business Tips, Content Marketing, Fresh Insights, News & Updates, Online Marketing, website hosting. You can follow any responses to this entry through the RSS 2.0 feed. Both comments and pings are currently closed.